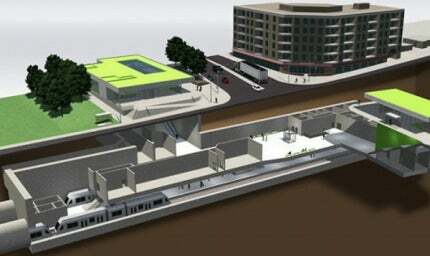 Bayview Station will be one of the 13 stations, to be constructed underground. Image courtesy of Hatch Mott MacDonald. Bombardier's Flexity Freedom will run on the Eglinton Crosstown LRT line. Image courtesy of Metrolinx. Four Caterpillar tunnel boring machines (TBMs) named Dennis, Lea, Don and Humber are being used to bore the twin tunnels. Image courtesy of Metrolinx. Eglinton Crosstown Light Rail Transit (ECLRT), commonly referred to as Crosstown, is a 19km light rail transit (LRT) line being constructed from Kennedy Station to Mount Dennis (Weston Road) in Toronto, Canada. Approximately 10km of the line will be located underground and up to 26 stations will be built along the stretch. The total approved budget for the Crosstown project is $5.3bn. Up to 5,400 passengers are estimated to travel on the line during peak hours by 2031. The owner, Metrolinx, is overseeing the design and construction, while the Toronto Transit Commission (TTC) will operate the LRT line, which is scheduled to start operations in 2020. Pre-construction works for the project commenced in mid-2011 and tunnel boring started in June 2013. The project is expected to save travel time along the Eglinton Avenue by 60%, compared with the use of the existing bus service. The project forms part of The Big Move, a 25-year regional transportation plan for the Greater Toronto and Hamilton Area (GTHA) worth $50bn. The plan was launched by Metrolinx in September 2008. The larger project will extend the length of rapid transit service within the GTHA to 1,725km, reduce commute times by 77min a person a day and cut greenhouse gas emissions a passenger by 29%. Crosstown further forms the main component of the $8.4bn investment announced by the Ontario government, as part of The Big Move, to expand the transit system in Toronto. Four LRTs, including Crosstown, are currently being constructed as part of this investment. The 10km twin tunnels will be located between Keele Street and Laird Drive, while the remaining sections of the LRT will include 1.5km of cut-and-cover tunnels, 0.5km of elevated guideway and 7km of at-grade right-of-way surface transit guideway, with signalling provided at intersections. Up to 54 bus routes, three subway stations and several GO Transit lines will be connected to the Crosstown. Of the overall 26 stations, 13 stations will be located underground. A maintenance and storage facility for the line’s rolling stock will be located at Mount Dennis Station and emergency exit buildings will be located on certain sections of the tunnels. The tunnels will have an internal diameter of 5.57m and are being bored using four tunnel boring machines (TBMs) each measuring 81m in length. The TBMs, named Dennis, Lea, Don and Humber, were supplied by Caterpillar. The twin tunnels are being constructed under two separate sections, which were awarded to two different contractors. The first section covering 6.2km will stretch from the west launch shaft area at Black Creek Drive to Yonge Street in the east section, and is being bored by the Dennis and Lea TBMs. Train de l’Est is a new commuter rail line under construction in the Montreal metropolitan area in Quebec, Canada. The second section will be bored by Don and Humber from a launch shaft located east of Brentcliffe Road to an extraction shaft located east of Yonge Street. Tunneling of the eastern portion is expected to start in late 2015. Up to 88,500 precast lining segments will be laid along the tunnels. The TBMs are located at 16m to 20m below-ground, tunnelling at a rate of 10m to 15m a day. The project will involve the removal of 1.16 million cubic metres of soil in total. Ongoing construction activities for the project include the installation of headwalls or temporary support walls to assist excavation for the construction of the stations. Construction of the headwalls at Keele and Caledonia are completed and in April 2013, work started for the construction of the Dufferin and Oakwood stations. Extraction and launch shafts are also being built at Allen Road to avoid impediments to the operation of the TTC subway Line 1 (York-University-Spadina) during the construction of Crosstown. The stations will feature designated waiting areas, closed-circuit TV, and wheelchair and stroller access. Outdoor parking space will be provided at all stations, while certain stations, including Mount Dennis, Eglinton West, Don Mills and Kennedy, will feature indoor parking space too. The main entrances of all the stations will be equipped with lifts and escalators. Bombardier’s Flexity Freedom rolling stock will be used on the Eglinton Crosstown LRT line. Metrolinx awarded a $770m contract to Bombardier, for delivery of 182 light rail vehicles (LRVs), including an option for 118 additional vehicles to operate on the four LRT lines being constructed in Toronto. The trains will have multiple entrance doors and low floors to enhance accessibility. A PRESTO proof-of-payment system will be installed in each vehicle. The LRVs will each have a full capacity of 163, which can be optionally increased to 490 by connecting three cars. The LRVs are expected to run at a speed of 28km/h. Bombardier Transportation received a $308m contract from Crosslinx in July 2015, to provide 30-years of maintenance service for Flexity Freedom LRVs to be introduced on the new line. The Crosslinx Transit Solutions consortium was preferred to construct, design, finance and maintain the Eglinton Crosstown LRT, in June 2015. The consortium partners include SNC-Lavalin, ACS Infrastructure Canada, EllisDon and Aecon. The first $320m tunnelling contract for the project was awarded to a consortium comprised Kenny Construction, Kenaidan Contracting, Obayashi Canada and Technicore Underground. Kenaidan was also involved in constructing the west launch shaft under a separate contract. The second tunnelling contract worth $177m was awarded to the 50/50 joint venture (JV) of Aecon and ACS Dragados Canada in November 2013. The precast tunnel lining segments are being supplied by Munro. Hatch Mott MacDonald is providing detailed design and construction management services for the tunnels, the cut-and-cover tunnel, elevated guideway and six underground stations, while CH2M HILL is providing owner’s engineer and programme management services for the Canadian light rail transit project. The preliminary planning activities for the project were carried out by Aecom, which is also acting as the consulting engineer and is involved in the design of Chaplin Station. The subsurface utility engineering (SUE) investigation along the entire stretch of the LRT was done by T2 Utility Engineers (T2ue).